you'd know that I mentioned the boarding pass that I almost didn't get. I almost didn't get to go on this trip. It was a graduation trip with the babes. The panic day started normal like any other day. Our plane was scheduled to fly at 3 something that afternoon. took the bus to LCCT. and we were talking about passports. 6 months before the passport expired. Everyone please take note if it's your second time travelling with the same passport. You don't wanna be the one left behind. You don't even wanna experience that feeling. and hoped the lady checking us in would miss that part. she has perfect eye sight. It hit me like a rock hurled at 300km/h. She asked me to go to the service counter and see if the people there can help. it's stated here at No.2 that you can't fly withing 6 months of expiry. THE GIRL JUST FREAKING TOLD ME!!! There was nothing that he can do to help. 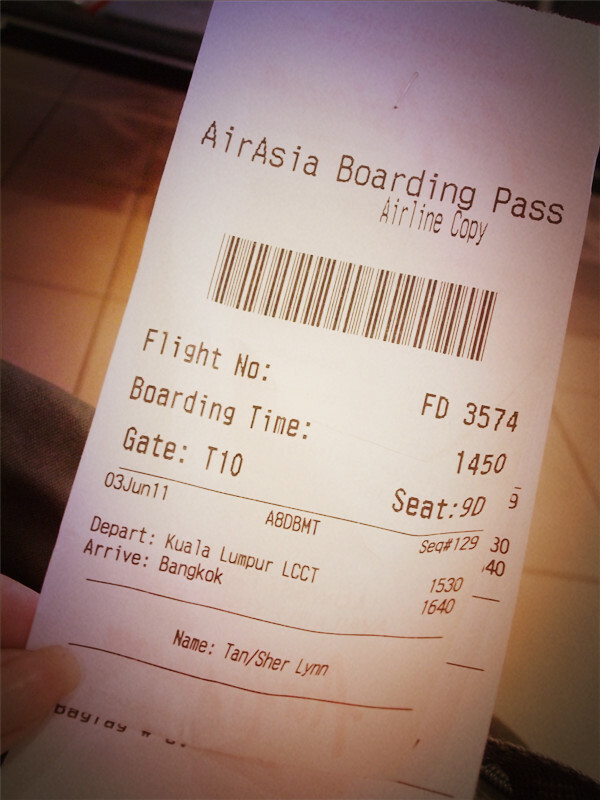 which means by then my plane would have reached Penang. I was kinda calm actually. Despite being hit by a 300km/h rock. I decided on the spot that I'll not do anything. which is the cheapest flight to Bangkok. It was the next night at 10.30p.m. I totally gave up at that point. Even said goodbye to the girls. if there was anything that he can do. But the other guy could. told him to let me pass. Now I regretted not taking down the guy's name. Should send him a thank you gift from Bangkok. I'll check their website to see if I can find the list of employee. all of you get to read more about Bangkok. The train "ticket" from the airport to the station near our hotel. We stayed at Ecotel Bangkok. The rooms were really clean. we rested awhile and went out again. Didn't take any photos there. I can't show them here anyway. don't let your bf/husband go to Pat Pong without you by their side. Same thing goes to the boys. It's quite dangerous for girls to go there actually. The people there are just rude and disgusting. The stalls by the road sells stuff that you don't see at night markets. and panic round two started. which produces a lot of horror movie. It was a whistling sorta howling noise. and they didn't help at all. It's like it knows when the guy's here. We went back to the room and sleep. Ecotel - Nice without weird noise. McThai - Medium sized sets are large Malaysian sizes.